There is reality. And there is theory. Professional traders know the difference. DO YOU? After more than 30 years in the options business, and after constant requests, I created my best course on market probability ever. 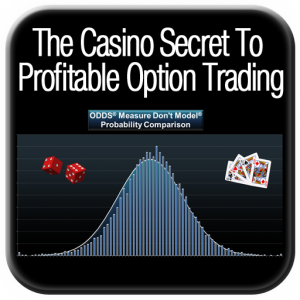 Because options are all based on the ODDS of success, the title is perfect: The Casino Secret to Profitable Options Trading. And in this intensive educational course, I’ll teach you how to get a casino-like edge, so you can BE THE HOUSE. This is easily my favorite educational course of all time. In fact, I'm so absolutely sure that this course will help your understanding of the markets that I'm offering you a 90-day, bullet-proof performance backed guarantee to prove it! This new course will catapult your results with a proven edge, because I’ll show you how you can realistically gain an unfair advantage. It's perfect for beginning traders, but also well-suited for experienced traders who want to make sure they're using professional traders’ secrets to achieve the best results. 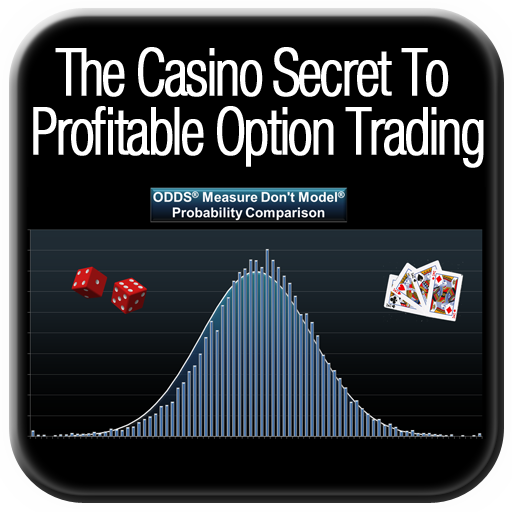 I know if will help you to think about probability and ODDS in a way you never did. That's how you get the edge. That’s how you get an unfair advantage. Go ahead... put ODDS® in your favor with The Casino Secret to Profitable Options Trading™. And remember, We Make Options Easy!